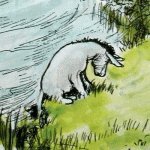 The old grey donkey, Eeyore stood by himself in a thistly corner of the Forest, his front feet well apart, his head on one side, and thought about things. Sometimes he thought sadly to himself, “Why?” and sometimes he thought, “Wherefore?” and sometimes he thought, “Inasmuch as which?” and sometimes he didn’t quite know what he was thinking about. So when Winnie-the-Pooh came stumping along, Eeyore was very glad to be able to stop thinking for a little, in order to say “How do you do?” in a gloomy manner to him. — Alan Alexander (A. A.) Milne in “In Which Eeyore Loses a Tail and Pooh Finds One” available in Winnie-the-Pooh, (New York: E. P. Dutton, 1926), p. 44-5. Posted on behalf of Alan Alexander Milne on Saturday, April 24th, 2010 under Quotations. I love those characters and the 2 books there are great, here is a sample of a post regarding eeyeore, one of the first I made.